The other day I felt like having a cookie after supper, but I didn't have any cookies. All the baking that has been going on around here must be having an effect on my mental processes, because without even really thinking about it, I cracked open the Baking Illustrated best-recipe book and dug around for the cookie I was craving... and ideally, that I had ingredients for. 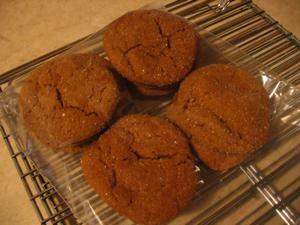 And banged out a batch of totally spectacular molasses cookies, yay me. They were soft and spicy, and quite a bit like my grandma's "aunt lila's cookies" except not as dark brown, and moister. Good for dessert, good for breakfast. Yay cookies! Oh my. I love soft molasses cookies. I'm going to have to get that recipe from you - or I guess maybe I should just buy that book!